While I was "hanging out" at Bridetastic's virtual Cafe, I read Bridetastic Bride rachelcrz' question: "It seems that engagement/wedding proposal planning is a trend in the US. I wonder how much effort Pinoy men really put into the proposal planning." -- I immediately felt the need to boast of our Pinoy men (naks)! I think Pinoy men are very rebelliously creative when it comes to their proposals! So naturally, I answered rachelcrz' question with links to some of the awesome proposals that I am quite familiar with. Here are just some of those proposals! April 28, 2011 - the staff of Magic 89.9 was briefed that a proposal was going to take place live, on-air, during DJ's CJ and Suzi's The Big Meal show. 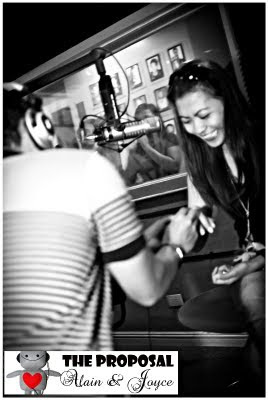 The radio station was just as excited, nervous, and anxious as the soon-to-be engaged lover boy because it was actually the first-ever proposal the station will ever have in history. Alain's wife, Joyce, had actually dreamed of a simple, dinner, for a proposal. So to Alain, a dinner proposal was naturally out of the question. He wanted something different, he wanted everything to be special. That's how Alain thought of proposing live, on-air, at the Magic 89.9 DJ booth. The initial plan was to tell Joyce that he had a meeting at the station, and Alain had conspired with the DJs to have a specific segment/time for him to be called inside the booth. Alain had prepared a speech for the occasion. But plans were slightly changed when the couple actually had a fight. Trying to convince Joyce to go to the station took longer than expected, so when the couple finally arrived in the station, a different segment was already going on, and Alain was caught off-guard when he was called to enter the booth to participate in the discussion. As Alain gave the DJs a weird look while trying to answer the questions thrown at him, Joyce was also called inside the booth to join in the discussion as well. Alain was asked if there was anything else he wanted to say. Still clueless, Alain greeted his mom---hahahah! The DJs still egged him on, then that's when Alain realized that this was his "moment". Having expected a different scenario, Alain forgot his speech and fumbled. But he did it. Joyce started crying and couldn't answer. Alain--now panicked---pleaded for Joyce to say anything at this point. Then Joyce, in between tears of joy, finally found the words to say yes. History has been made, indeed. Ryan writes: "It took me about 3 months to plan everything. Kitin (Kristine Flores) knew that my family will be out of town on that day so she had nothing planned yet on the weekend. About 3 days before the event, Kat, one of her kabarkadas from the States texted her saying that she has to talk to her and Ria (her best friend in the Phils) about a drastic decision that she was about to make. I told Ria to tell Kitin that her only available day was on Nov 5 because of her very hectic week. Since Ria works for Sun Cellular, they will be having a block screening for a client on that day and they can just stay for the movie and call Kat after. 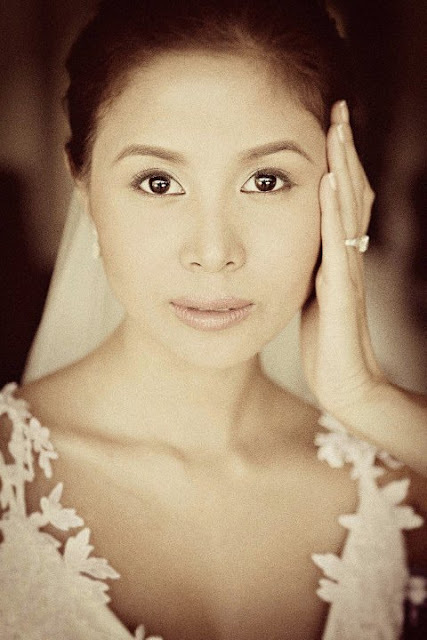 Niña Cuenca writes: "It was the first sunrise of 2009 when Mikki asked me to marry him. It was our 10th year together and taking it to the next level meant a more symbolic proposal for him. He did it on a cliff in Tagaytay overlooking the lake, which had a dreamy hue as the first traces of light emerged. The summit meant that we were at a high point in our relationship, and the break of dawn signified a new beginning for us. How he proposed was simple yet profound. As I peered thru his camera, I found the words ‘Will you marry me?' 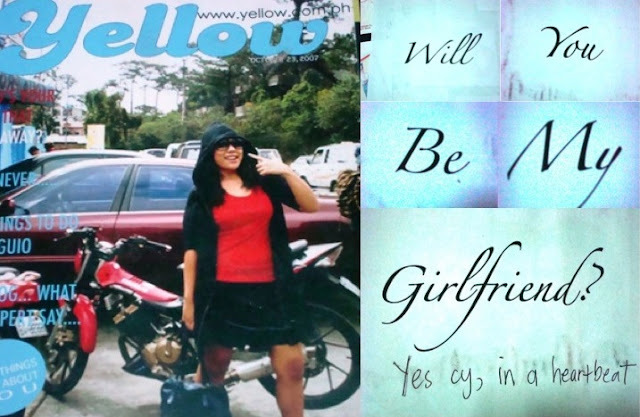 inscribed on his most prized lens, an unforgettable act of sweetness and self surrender," Niña shares. For those who need a translation, Coach Rio and his fiancee Nicole explains in the video how they met in the University of the Philippines so that's where Coach Rio decided to propose. Their first encounter was during a marathon, the second during a Jeepney ride so Coach integrated the Jeepney and the Oblation during his proposal. To make it even more unforgettable, he commissioned no other than Up Dharma Down to sing their famous song, Tadhana. 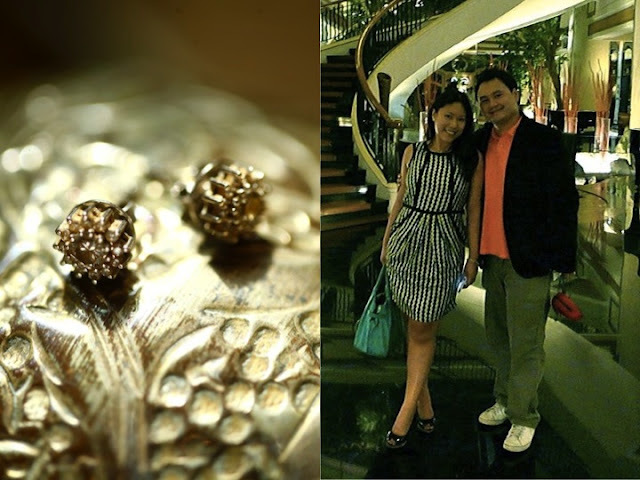 The Earrings Proposal - It was April 10, 2010 when Cy and I celebrated our two-year anniversary. We were actually already secretly planning our wedding and it was just a matter of formalizing it through a proposal. I wasn't expecting a proposal though, because I had specifically told him that I didn't want a ring (click HERE for related article). Little did I know that he was going to be "rebellious" in his own way by proposing with engagement EARRINGS instead. He said that everyone else has an engagement ring...so I deserved something more unique and special.